Not to be confused with chiton or chitlin. For the village in Iran, see Chetan, Iran. Structure of the chitin molecule, showing two of the N-acetylglucosamine units that repeat to form long chains in β-(1→4)-linkage. Haworth projection of the chitin molecule. A close-up of the wing of a sap beetle; the wing is composed of chitin. Chitin (C8H13O5N)n (/ˈkaɪtᵻn/ KY-tin) is a long-chain polymer of an N-acetylglucosamine, a derivative of glucose, and is found in many places throughout the natural world. It is a characteristic component of the cell walls of fungi, the exoskeletons of arthropods such as crustaceans (e.g., crabs, lobsters and shrimps) and insects, the radulae of molluscs, and the beaks and internal shells of cephalopods, including squid and octopuses and on the scales and other soft tissues of fish and lissamphibians. The structure of chitin is comparable to the polysaccharide cellulose, forming crystalline nanofibrils or whiskers. In terms of function, it may be compared to the protein keratin. Chitin has proved versatile for several medicinal, industrial and biotechnological purposes. The English word "chitin" comes from the French word chitine, which first appeared in 1821 and derived from the Greek word χιτών (chiton), meaning covering. The structure of chitin was solved by Albert Hofmann in 1929. Chitin is a modified polysaccharide that contains nitrogen; it is synthesized from units of N-acetyl-D-glucosamine (to be precise, 2-(acetylamino)-2-deoxy-D-glucose). 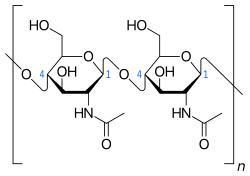 These units form covalent β-(1→4)-linkages (similar to the linkages between glucose units forming cellulose). Therefore, chitin may be described as cellulose with one hydroxyl group on each monomer replaced with an acetyl amine group. This allows for increased hydrogen bonding between adjacent polymers, giving the chitin-polymer matrix increased strength. In its pure, unmodified form, chitin is translucent, pliable, resilient, and quite tough. In most arthropods, however, it is often modified, occurring largely as a component of composite materials, such as in sclerotin, a tanned proteinaceous matrix, which forms much of the exoskeleton of insects. Combined with calcium carbonate, as in the shells of crustaceans and molluscs, chitin produces a much stronger composite. This composite material is much harder and stiffer than pure chitin, and is tougher and less brittle than pure calcium carbonate. Another difference between pure and composite forms can be seen by comparing the flexible body wall of a caterpillar (mainly chitin) to the stiff, light elytron of a beetle (containing a large proportion of sclerotin). Scarab beetles in the genus Cyphochilus demonstrate an exceptional form of chitin in the white scales covering their bodies, as they are whiter than milk or the average human tooth. What makes these scales so white is the special arrangement of the chitin elements inside them, together with their varied shapes and sizes; the chitin filaments are just a few millionths of a metre thick, and tightly packed, scattering light efficiently, deflecting all colours with equal strength, but still able keep a degree of disorder in their shape. In addition, some social wasps species, such as Protopolybia chartergoides, orally secrete material containing predominantly chitin to build envelopes for their nests. In butterfly wing scales, chitin is organized into stacks of gyroids constructed of chitin photonic crystals that produce various iridescent colors serving phenotypic signaling and communication for mating and foraging. Chitin was probably present in the exoskeletons of Cambrian arthropods such as trilobites. The oldest preserved chitin dates to the Oligocene, about 25 million years ago, consisting of a scorpion encased in amber. 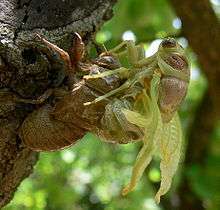 Most recent studies point out that chitin is a good inducer of defense mechanisms in plants. It has also been assessed as a fertilizer that can improve overall crop yields. The EPA regulates chitin for agricultural use within the USA. Chitosan is prepared from chitin by deacetylation. Chitin is used in industry in many processes. Examples of the potential uses of chemically modified chitin in food processing include the formation of edible films and as an additive to thicken and stabilize foods and pharmaceuticals. It also acts as a binder in dyes, fabrics, and adhesives. Industrial separation membranes and ion-exchange media can be made from chitin. Processes to size and strengthen paper employ chitin and chitosan. Researchers have developed a method for using chitosan as a reproducible form of biodegradable plastic and as a promising substrate for engineering human tissues by use of three-dimensional bioprinting. Chitin's flexibility and strength make it favorable as surgical thread. Its biodegradibility means it wears away with time as the wound heals. Moreover, chitin has been reported to have some unusual properties that accelerate healing of wounds in humans. Occupations associated with high environmental chitin levels, such as shellfish processors, are prone to high incidences of asthma. Recent studies have suggested that chitin may play a role in a possible pathway in human allergic disease. To be specific, mice treated with chitin develop an allergic response, characterized by a build-up of interleukin-4-expressing innate immune cells. In these treated mice, additional treatment with a chitinase enzyme abolishes the response. Chitin may be employed for affinity purification of recombinant protein. A chitin binding moiety is genetically fused to a protein of interest and then connected to beads coated with chitin. The immobilized protein is purified and released from the beads by cleaving off the chitin binding moiety. The elaborate chitin gyroid construction in butterfly wings creates a model of optical devices having potential for innovations in biomimicry. A. Hofmann (1929) "Über den enzymatischen Abbau des Chitins und Chitosans" (On the enzymatic degradation of chitin and chitosan), Ph.D. thesis, University of Zurich (Zurich, Switzerland). P. Karrer and A. Hofmann (1929) "Polysaccharide XXXIX. Über den enzymatischen Abbau von Chitin and Chitosan I," Helvetica Chimica Acta, 12 (1) : 616-637. ↑ Gilbert, Lawrence I. (2009). 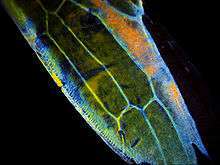 Insect development : morphogenesis, molting and metamorphosis. Amsterdam Boston: Elsevier/Academic Press. ISBN 978-0-12-375136-2. ↑ Dasi Espuig M (16 August 2014). "Beetles' whiteness understood". BBC News: Science and Environment. Retrieved 15 November 2014. ↑ Burresi, Matteo; Cortese, Lorenzo; Pattelli, Lorenzo; Kolle, Mathias; Vukusic, Peter; Wiersma, Diederik S.; Steiner, Ullrich; Vignolini, Silvia (2014). "Bright-white beetle scales optimise multiple scattering of light". Scientific Reports. 4. doi:10.1038/srep06075. ↑ Kudô, K. Nest materials and some chemical characteristics of nests of a New World swarm-founding polistine wasp, (Hymenoptera Vespidae). Ethology, ecology & evolution 13.4 Oct 2001: 351-360. Dipartimento di biologia animale e genetica, Università di Firenze. 16 Oct 2014. ↑ Briggs, DEG (29 January 1999). "Molecular taphonomy of animal and plant cuticles: selective preservation and diagenesis". Philosophical Transactions of the Royal Society B: Biological Sciences. 354 (1379): 7–17. doi:10.1098/rstb.1999.0356. PMC 1692454 . ↑ "EPA: Chitin; Poly-N-acetyl-D-glucosamine (128991) Fact Sheet". ↑ Shahidi, F.; Arachchi, J.K.V. ; Jeon, Y.-J. (1999). "Food applications of chitin and chitosans". Trends in Food Science & Technology. 10: 37–51. doi:10.1016/s0924-2244(99)00017-5. ↑ Hosokawa J, Nishiyama M, Yoshihara K, Kubo T (1990). "Biodegradable film derived from chitosan & homogenized cellulose". Ind.Eng.Chem.Res. 44: 646–650. ↑ Gaellstedt M, Brottman A, Hedenqvist MS (2005). "Packaging related properties lf protein and chitosan coated paper". Packaging Technology and Science. 18: 160–170. ↑ "Harvard researchers develop bioplastic made from shrimp shells". Fox News. 16 May 2014. Retrieved 24 May 2014. ↑ Bhuvanesh Gupta; Abha Arorab; Shalini Saxena; Mohammad Sarwar Alam (July 2008). "Preparation of chitosan–polyethylene glycol coated cotton membranes for wound dressings: preparation and characterization". Polymers for Advanced Technologies. 20: 58–65. doi:10.1002/pat.1280. ↑ Morganti P, Fabrizi G, et al. (2012). "Anti-aging activity of chitin nanofibrils complexes". The Journal of Nutrition, Health & Aging. 16 (3): 242–245. doi:10.1007/s12603-011-0358-0. ↑ Tiffany A. Reese; Hong-Erh Liang; Andrew M. Tager; Andrew D. Luster; Nico Van Rooijen; David Voehringer; Richard M. Locksley (3 May 2007). "Chitin induces accumulation in tissue of innate immune cells associated with allergy". Nature. 447 (7140): 92–96. doi:10.1038/nature05746. PMC 2527589 . PMID 17450126. Wikimedia Commons has media related to Chitin.